The Nokia 9 PureView smartphone from HMD Global has been one of the most anticipated smartphones for a while now. This is because the smartphone is tipped to be the first in the world to come with an array of five cameras on the rear panel and flagship-grade spec sheet. Now, a new image has been spotted on the internet, which is being touted as the first press render of the handset. First posted by the noted tipster Evan Blass (@evleaks), the alleged press render shows the familiar penta camera arrangement arranged in 1-1-3 formation with ZEISS optics, which we have seen in previous leaks. We can also see the 18:9 display with a fingerprint icon towards the bottom half indicating the presence of an in-display fingerprint scanner. 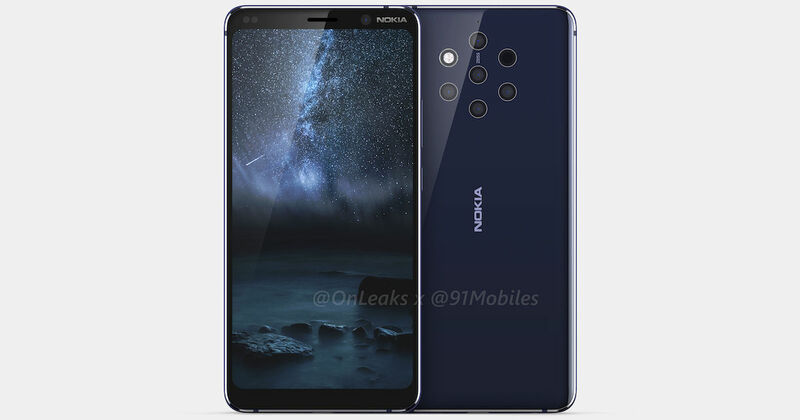 Notably, the Nokia 9 could be the first ever offering from the brand to come with under-display biometrics. Further, the image reveals that the handset will come with all glass build and metal chassis. There is Android One branding on the rear panel confirming that the handset will come with stock Android, likely to be Android 9 Pie. To recap on earlier rumours, the smartphone will come with a 6-inch display featuring a 18:9 aspect ratio and bezels on top and bottom. According to rumours, the Nokia 9 will come powered by the Qualcomm Snapdragon 845 chipset. Lastly, the leaks suggest that the upcoming flagship will come with a massive 4,150mAh battery with fast charging battery. Unfortunately, no other details regarding the spec sheet of the Nokia 9 is known at the moment.